With 180 sites listed in the National Register of Historic Places, including 17 historic districts and 2 National Historic Landmarks, Austin puts you at the heart of Texas history. From the Texas State Capitol to the Paramount Theatre, the Driskill Hotel to Barton Springs, the heritage of the Lone Star State lives and breathes throughout our city. We invite you to explore, experience and enjoy Austin’s many memorable attractions and make our history part of yours. Barton Springs Pool. PICA 01009, Austin History Center, Austin Public Library. Citizens of Austin enjoy a lush 350-acre park in the heart of the city thanks to the generosity of Andrew Jackson Zilker, an early Austin businessman and philanthropist. During the Great Depression, federally-funded improvement projects enhanced the park’s natural beauty. 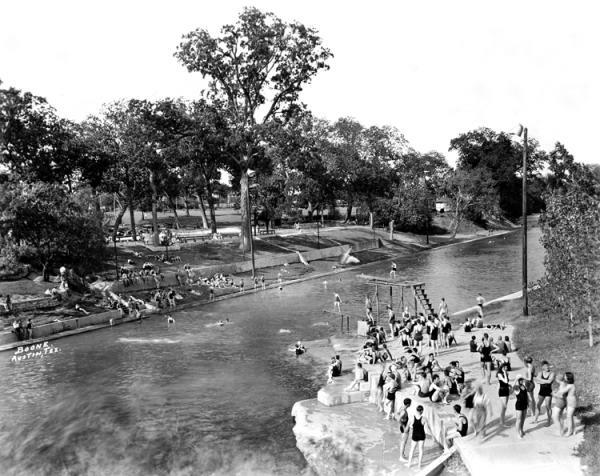 The springs are named after William Barton, who arrived in the late 1830s, shortly before the city of Austin was created. As a slave-holder, Barton brought Austin’s first African Americans to the local community. In 1898 geologists identified the Edwards Aquifer, which provides water running through limestone channels to feed the springs. Environmentalists have been fighting threats to the aquifer for years. The City of Austin has acquired many acres in the recharge zone to protect it. In 1997 the Barton Springs Salamander, which exists only in this area, was designated an endangered species by the U.S. Fish and Wildlife Service. Barton Springs’ swimming hole is an Austin institution. Its 1947 Bathhouse was designed in Moderne style by Dan Driscoll, an architect for the City of Austin. The botanical garden, with its 1964 building, represents a collaboration of 31 local garden clubs. The Taniguchi Garden was completed in 1969 by Isamu Taniguchi, who placed many of the stones with his own hands. The 1840s Swedish Log Cabin and 1866 Esperanza Schoolhouse were moved to the park from their original locations. 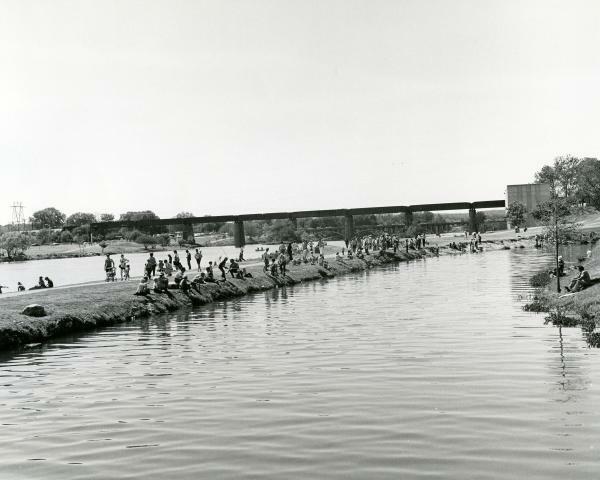 In 1960, a dam was built on the Colorado River to create a lake local to downtown Austin. Originally called Town Lake, it was the seventh in a chain of lakes along the Colorado. Lady Bird Johnson led a campaign in the 1970s to add a trail system and landscaping to the waterfront. After her death in 2007, the lake was renamed in her honor. often be seen flying out from under the bridge at twilight as they emerge in search of insects. of the city. Travis Heights was developed later on adjacent land in 1913. A greenbelt winds through the neighborhoods. Approximate boundary: South Congress Avenue to I.H. 35; Riverside Drive to Monroe Street. Private homes; view from the street. Big Stacy Park has a free public pool, with warm water from an artesian well. The buildings on South Congress Avenue, mostly from the 1930s, are modest, but they have been adapted in creative ways for locally-owned shops and restaurants. Notable sites include Guero&apos;s Taco Bar which is located in a converted feed-and-seed store from the 1800s and two motels from the 1930s. 1000 – 1900 blocks of South Congress Avenue. Farther down Congress Avenue is St. Edward’s University, with an 1888 Gothic Revival main building designed by Nicholas Clayton.